*Bookmark* With the primaries ending this week, get a refresher on the competitive general election races with Roll Call’s Election Guide, featuring race ratings from Inside Elections with Nathan L. Gonzales. *Bonus Bookmark* We’re doing it live! Roll Call is hosting a live At the Races event on Wednesday, Sept. 26. 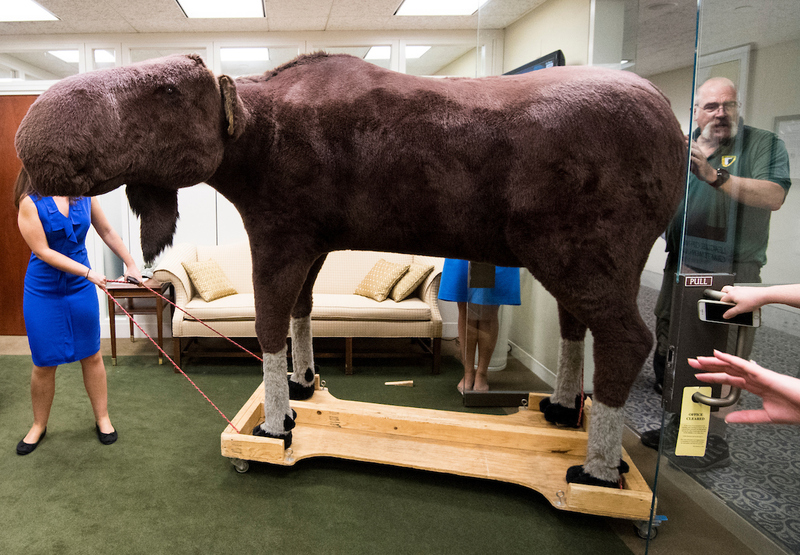 GOP Rep. Ileana Ros-Lehtinen will give us her thoughts on the midterms. And Nathan, Bridget and Simone will talk through the election dynamics with Fox News’ Ed Henry (also a Roll Call alum). Register here. So About the House … DCCC Chairman Ben Ray Luján is confident Democrats will take over the House, but he told reporters on Thursday it’s going to be a tough fight — even speculating House control might not be known on election night because of the number of close races. So what keeps him up at night? Trump on the Trail (Kind of): NRCC Chairman Steve Stivers said at a recent Christian Science Monitor breakfast that the committee knows how to use President Donald Trump — but that doesn’t always mean sending him into competitive districts. Stivers also identified his midterm bellwethers (hint: they’re all in the same state), and surprisingly pleaded ignorance about well-publicized disparaging comments made by the Republican nominee in one of the GOP’s top pickup opportunities in that state. How She Did It: Ayanna Pressley’s upset victory over longtime Rep. Michael E. Capuano surprised a lot of people, but not the campaign consultant who helped her tap Boston’s overlooked minority voters. Pressley’s campaign ignored pollsters who predicted that white voters would determine the outcome of the vote in Massachusetts’ 7th District. Last month, she became the second minority female candidate to topple a white male incumbent this primary season. Read more about the strategy here. McCain Lives On: In campaign ads, that is. A New Jersey Democratic candidate used footage of the late Arizona senator from his confirmation hearing in a positive TV spot this week. The same day, the National Republican Congressional Committee released an attack ad against a Michigan Democrat using footage of McCain from her confirmation hearing. The NRCC also used footage of an ad from McCain’s 2016 Senate race against Democrat Ann Kirkpatrick in a new ad criticizing the former congresswoman, who is running in Arizona’s 2nd District. Six Republican women are not running for re-election to the House this year. That’s a quarter of the women in the GOP conference. Stivers said last week he’s “very confident” House Republicans could increase the number of women in their ranks this year, but Simone explains why that’s unlikely. Stu Rothenberg is subbing for Nathan this week with his column on why he thinks the Senate is now in play. He was not saying that a few weeks ago. What changed his mind? Justin Fareed is making his third run for Congress in California’s 24th District, and this Republican rancher/sports injury product company executive/former Hill staffer isn’t horsing around this time. In 2016, Fareed rode a horse into the closing shot of a campaign ad and then curiously said, “We’ll talk more later.” (Do yourself a favor and watch. It only gets better with time.) Fareed said in a recent interview he won’t be riding a horse in an ad again. Last cycle, he wanted to introduce himself to voters and explain his bio. This cycle, he said, his ads will be all about issue. Fareed is challenging Democratic Rep. Salud Carbajal in a district that Hillary Clinton carried by 20 points. Carbajal defeated Fareed by 7 points in the open-seat race in 2016. Inside Elections rates the race Solid Democratic. Nebraska’s Senate race could be a long-shot pick-up opportunity for Democrats, but it would take a lot to go right for Lincoln City Councilor Jane Raybould to unseat Deb Fischer, who is a GOP deputy whip in the Senate. Trump carried Nebraska by 25 points in 2016, and 48 percent of the state’s registered voters were Republican in 2018, compared to 29.5 percent who were Democrats. Raybould has some name recognition from running her family’s grocery business, and she has run in a statewide race before in an unsuccessful bid for lieutenant governor in 2014. That and uncertainty about how Nebraska’s rural voters would respond to Trump’s tariffs has led some handicappers to predict that the race could be competitive. Raybould has been hammering Fischer in TV ads and an August debate for taking corporate campaign contributions and for reporting drastic increases in her net worth, calling it a sign of “corruption.” But Fischer, whose family owns a cattle ranch, has weathered this kind of attack before. And Raybould has had some problems getting the support of organized labor, an inauspicious sign for a Democrat in a red state. Inside Elections rates the seat Solid Republican. For next week, email us at attheraces@cqrollcall.com and let us know which race you want to know more about: Illinois’ 14th District or Ohio Senate. Simone and photojournalist Tom Williams will be hitting the campaign trail in Minnesota next week (follow them on Twitter here and here). 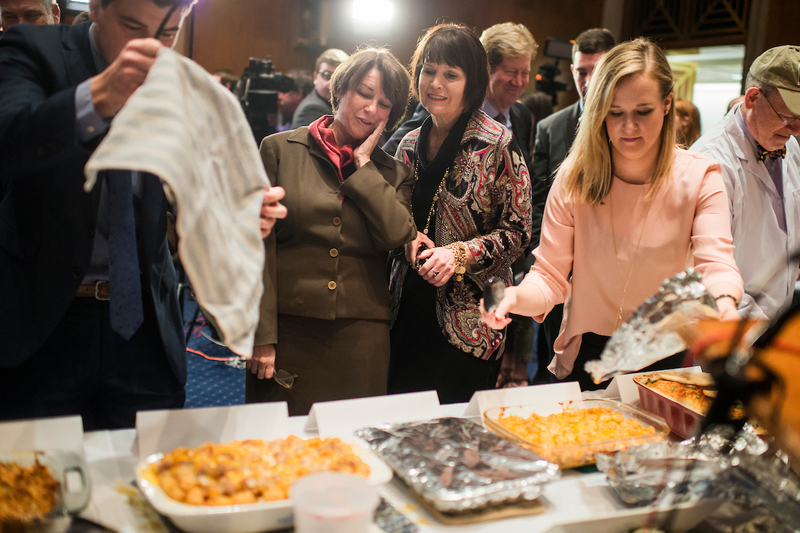 In preparation, here’s a throwback (taken by Tom) to the 2017 hotdish competition hosted by the Minnesota congressional delegation.